Welcome to the beautiful Emerald Towers West, located in Fort Walton, Florida. The luxurious vacation rentals can sleep between 2-8 guests and offer gorgeous water views. The complex also features a concierge service for guest looking for vacation activity recommendations. Be sure to take a dip in the lovely community pool while staying in Emerald Towers West. The Fort Walton area offers vacationers a wide range of fantastic activities to participate in. Spend some time on the beach swimming, boogey boarding, or tanning. Join fellow vacationers in a game of sand volleyball. If you would like to ramp up the excitement, consider taking a parasailing trip. Imagine soaring high above the water and looking down upon the tropical paradise your vacationing in. Not a bad way to enjoy a vacation! Guests that enjoy golfing can be assured that there are multiple courses in the area for their enjoyment. With so much to do and see, guests are sure to have an unforgettable vacation experience. 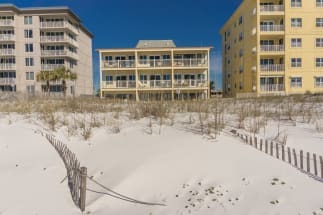 Emeraldcoastbyowner.com is the best place to find, plan, and book your Fort Walton vacation rental property. ECBYO.com aims to take the hassle and stress out of planning and booking your vacation rental property, so all you must do is decide which adventure to partake in first. Contact the property owners directly by hitting the EMAIL OWNER button found on each listing. Book now, you won’t regret it!